'Kangaroo court' in Brockton, Mass. 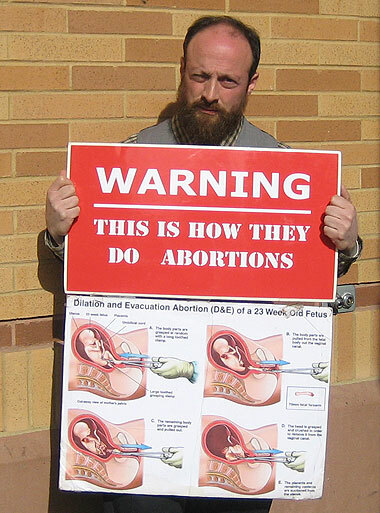 convicts pro-life activist Peter D'Attilio on three charges. After having had phony charges against him dismissed several times, this was bound to happen eventually. 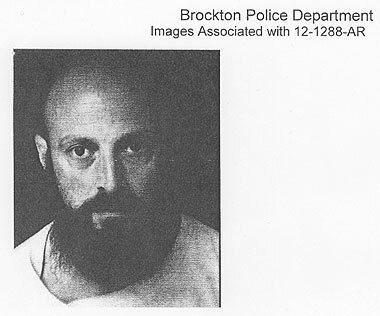 On Wednesday, Feb. 12, pro-life activist Peter D'Attilio was convicted by a jury on three charges stemming from an incident when he held a pro-life sign in front of a school in Brockton, Mass. on March 21, 2012. After a two-day trial in Brockton District Court, the six-person jury found him guilty of disturbing a school, trespass, and resisting arrest. MassResistance was present for the entire trial. 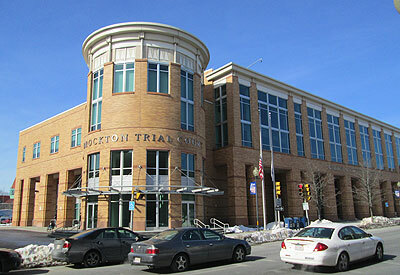 Brockton District Court in downtown Brockton, Mass. Those verdicts came despite the fact that Peter's lawyer (using testimony by the prosecution's own witnesses) clearly proved that he did not commit any of those crimes. This was a monumental miscarriage of justice. In the end, the facts and evidence mattered very little. Seemingly everything in this trial was stacked against him: (1) A hostile judge who was new to the bench. (2) A jury that appeared to be made up of several people who were strongly pro-abortion. (3) A young prosecutor who largely ignored the facts and focused on demonizing Peter personally in the eyes of the jury. And (4) a police report with blatant untruths. In our opinion, it seemed this was meant to send a strong message to pro-life activists. By local standards, this was a "nuisance" case that would normally never have gone forward. In Brockton there is a backlog of actual violent crimes. And this one, on its face, had no substance. It did not involve injury, damage, theft, etc., but was more political in nature. Nevertheless, neither the judge nor the District Attorney's office would relent. Peter D'Attilio is a pro-life hero in Massachusetts. He is a religious Catholic who runs a pro-life ministry called "Defenders of Women." Its mission is to educate high school and college students about the true nature of abortion, versus what Planned Parenthood tells them in school. He usually carries a sign with diagrams about a baby in the womb, and passes out bookmark-like pamphlets. 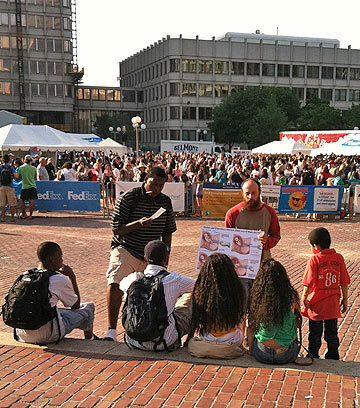 Peter gives a pro-life talk at Boston City Hall Plaza to kids who had gathered there -- while a Jimmy Fund event takes place behind him. Unfortunately, he has been viciously harassed and even beaten up by local police who don't like his message. A few years ago the Massachusetts Supreme Judicial Court ruled that people have the right to video police who are confronting them. So Peter brings a video camera for protection. It has come in handy; he has documented several illegal harassments by police with YouTube videos, such as this example. He is often falsely charged by angry police. Until now, every charge against him relating to carrying a sign has been dismissed by a judge. A few months previous to the incident in this case, Peter had an encounter at a different Brockton school with the same police officer. He was similarly not doing anything illegal. At that time, the police harassed him but did not arrest him. 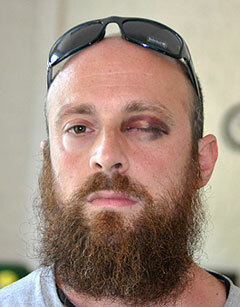 In 2011 Peter got this black eye when beaten by the police in Franklin, Mass. But there were no witnesses who would come forward. After that he decided to carry a video camera with him when holding his sign. Peter had been holding his sign with his handouts at the Brockton bus terminal about 7:30 am. A high school girl walking to school spoke to him. She said she was pro-life, and offered to show him where the school was. They walked to the school together, which was a few blocks away. She went into the school with some of his materials to give to others. Peter with the sign he was carrying on March 21, 2012. (It folded in the middle for easy carrying.) You can see a closer view of it here. Peter started walking down the sidewalk next to the school. There were only a few students around. Suddenly the school principal came out of the building and approached Peter, telling him that he was disturbing students. Peter pulled out his video camera and asked him to repeat what he said, but he turned around and walked back into the school. Peter continued to stand on the public sidewalk. Almost immediately a police officer came and began to approach Peter. Peter pulled out his video camera and turned it on. Peter asked the cop what he had done wrong, and told him that he had the right to stand on a public sidewalk. The cop got very angry and demanded that Peter leave immediately. He reached out and pushed the camcorder, but Peter held on to it. The cop got angrier and more threatening, so Peter decided to leave. He started walking away, crossing the street. The cop followed him and continued to yell at him, telling him to go home. Peter's video camera was still on and pointed toward the cop. He was also holding his sign and his handouts. As soon as Peter got to the other side, without any warning the cop tackled him to the ground. Peter then realized he was being arrested but did not know why. Peter went limp, and the cop quickly handcuffed him and put him into the patrol car. The cop took the video camera, but the sign and handouts were left behind on the ground. When Peter asked about his sign the cop refused to gather it. Normally, a police officer collects the person's property when arresting him. 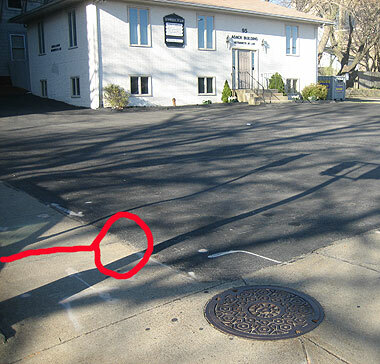 ABOVE: Peter was on sidewalk next to school. Principal came out red door near tree. Police officer confronted Peter on sidewalk in front of tree. Peter then crossed the street to leave the area. 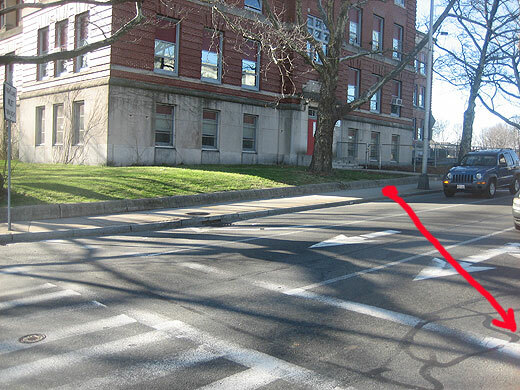 RIGHT: Police officer followed Peter across the street and tackled him to the ground here. Peter was taken to the station, but not taken inside immediately. They left him in the car for 20 minutes, which is unusual, before taking him inside. He was booked, fingerprinted, and charged with (1) disturbing a school; (2) trespass; and (3) resisting arrest. Afterwards, Peter had to go back to the school to try to find his sign. A crossing guard said he had it, but told Peter that the officer would not let him give it back. Peter was able to contact the officer and persuade him to allow him to have his sign. Peter was arraigned the next day in Brockton District Court. The officer's police report included several statements which Peter strongly denied. It said that the officer observed Peter "filming the students and school officials" and that he "informed Mr. D'Attilio several times that if he did not leave school grounds that he would be placed under arrest." It also said that Peter was "on school grounds" rather than on the public sidewalk. Is that true? Was Peter taping kids? Did the officer actually say those things to him? The tape in the video camera would certainly reveal that, since his camera was on the entire time the police officer was at the scene. After Peter's arraignment, the police finally gave Peter back his video camera. But the camera had been broken open and the cassette tape was missing. Peter asked numerous times about getting the tape back. A clerk at the police station told Peter that the police officer confirmed to her that he had taken the tape out of the camera and that he had the tape, but that Peter couldn't get it right now, though possibly later. 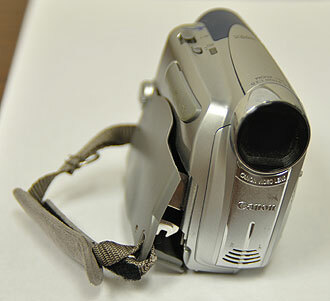 Peter's broken video camera right after he got it back from the Brockton Police Department. The cassette tape had disappeared. They kept stalling. After Peter's lawyer sent a formal letter to the department requesting the tape, the police changed their story and said that the camera had never had a tape in it. That's what the officer testified at the trial. Over the next 22 months there were several hearings and postponements. But the District Attorney's office insisted on prosecuting him. Finally, a jury trial was set for Tuesday, Feb. 11, in Brockton District Court. The trial lasted two days. The judge was Cynthia Brackett. She was appointed by Gov. Deval Patrick last fall and had been a judge for less than four months. Before that, she spent her entire legal career as an Assistant District Attorney in the Bristol County District Attorney's Office. From the beginning, Judge Brackett seemed to be hostile toward the defendant. In particular, she would not allow Peter's lawyer to question the prospective jurors about their position on the abortion issue, if they had been involved with pro-abortion activism, or any questions involving abortion. She said that the subject of Peter's sign (and his ministry to students) had no bearing on the case. So there was no way to tell how the jurors felt about that often very emotional subject. Judging by the body language and looks on the faces of jurors during the trial, it appeared that a number of them had pro-choice sentiments to various degrees. And the prosecutor took full advantage of that. To make matters worse, the police officer testified that the sign Peter was showing students "pictures of dead babies" and the slogan "say no to birth control." That was not exactly true. Peter's sign simply showed drawings of a baby in the mother's womb during the abortion procedure. But the judge ruled that the jury may not be allowed to see the sign. The judge also prohibited Peter's lawyer from asking prospective jurors whether they accept the principle that citizens have a constitutional right to free speech, even if it may be offensive to others, or the right to disseminate information in a peaceful manner. The prosecution had two witnesses: The principal of the school and the police officer. In several key instances, the eyewitness testimony of the principal was at odds with the police officer's testimony. And in many instances the police officer's testimony conflicted with the apparent facts. Peter was the only witness for his defense. During the two-day trial, the actual evidence against Peter was virtually non-existent. All three charges appeared to be thoroughly debunked. It appears that false statements were added to the police report to conjure up the idea of "disturbing a school" when in fact Peter simply walked by the school. Whoever willfully interrupts or disturbs a school or other assembly of people met for a lawful purpose shall be punished by imprisonment for not more than one month or by a fine of not more than fifty dollars . . . The claim: Blocking access to the school. The police report said that the principal stated that Peter was "on school grounds preventing students from entering the building. "At the beginning of the trial, the prosecutor told the jurors that Peter was "blocking the door of the school" and "trying to block students from going inside." At the trial: Both the principal and the police officer testified that they did not actually see Peter blocking anything, or impeding anyone in any way. The claim: Videotaping students. The police report said that the principal stated that Peter "was interviewing and recording students." The report also said that the police officer observed Peter "with a recording camera filming the students." At the trial: Both the principal and the police officer testified that they didn't actually see Peter filming any students at all. In addition, according to the testimony, no students had complained about Peter in any way. The public sidewalk is legally considered public property, not "private property" or "school property." That fact was not disputed in this trial. Whoever, without right enters or remains in or upon the dwelling house, buildings, boats or improved or enclosed land . . . after having been forbidden so to do by the person who has lawful control of said premises, whether directly or by notice posted thereon, . . . shall be punished by a fine of not more than one hundred dollars or by imprisonment for not more than thirty days or both such fine and imprisonment. The claim: The officer claimed that Peter left the sidewalk and briefly stood on the school walkway leading to the door -- and therefore was "trespassing." At the trial: Peter strongly disputed that, and stated he is always very careful only to stand on a public sidewalk or public street, and that he never had any reason to leave the sidewalk. This appears to be another trumped-up charge which fell apart during the officer's testimony.
. . . Whoever violates this section shall be punished by imprisonment in a jail or house of correction for not more than two and one-half years or a fine of not more than five hundred dollars, or both. The claim: The police report says that when the officer was placing Peter under arrest that he "proceeded to grab his right arm several times in order to place him under arrest. Mr. D'Attilio pulled back every time" -- and that that constitutes "resisting arrest." However, the claim does not reference any "physical force or violence" or "a substantial risk of causing bodily injury" to the police officer, as the statute requires. At the trial: The testimony revealed nothing remotely approaching the legal threshold for "resisting arrest." The police officer testified that Peter "pulled a little bit" but "it wasn't much of a struggle." The principal, who witnessed it, said substantially the same thing. Neither of them mentioned any fear of violence or risk of bodily injury. Peter testified that he simply went limp when the police officer tackled him. The real question is why the police officer tackled Peter to the ground. Peter was not running away. He was merely walking across the street. His hands were full; he was holding his sign and the flyers with one hand and the video camera with his other hand. He had no idea the police officer meant to arrest him. The principal also testified that Peter was walking across the street with his hands full. It's clear to us that the arrest came out of the officer's anger towards Peter, and that he charged him with "resisting arrest" for no good reason. A phony "resisting arrest" charge is unfortunately a common tactic. In another case in February 2012, a District Court judge actually berated the prosecutor for pursuing a phony resisting arrest charge against Peter. At various junctures during the trial when it was very clear that the case against Peter had no legal substance, his lawyer asked for a dismissal. Every time the prosecution vigorously contested it, and the judge steadfastly refused. Even with a terribly weak case, the prosecution insisted on continuing. In fact, the prosecutor's strategy had very little to do with the facts or the evidence. Instead, she focused almost entirely on demonizing Peter personally. She basically aimed to make the jury believe he was a dangerous threat to children and should be convicted no matter what happened in this incident. For her closing arguments to the jury, she had Peter's arrest photo introduced as evidence. She walked over and showed the photo to each juror and said something to the effect of "this is who he really is." This was a particularly odious trick. The photo was taken by the police department camera soon after Peter was tackled without warning, arrested, and brought into custody, and didn't know what was going to happen next. He was under extreme stress. The prosecutor introduced this police mug-shot of Peter as "evidence" and showed it to each individual juror in the juror's box. She twisted the nature of his pro-life ministry to make him seem like a child predator. Using Peter's testimony of how he had gotten to the school, she harangued the jury that Peter was simply a grown man who had "picked up" a high school girl at the train station, walked with her to the school, and tried to approach other children. And she persuaded the judge to allow Peter's sign to be brought into the courtroom, but showed only the blank side -- not the front side -- to the jury. Thus, the jury was led to believe that the police officer's testimony that the sign showed pictures of dead babies and a "say no to birth control" message was actually true. But they couldn't see the front! They all seemed very intent and not the least bit unsure of themselves. Peter was sentenced on the Trespass to 30 days House of Correction, suspended for one year. On the other two, he was placed on probation for one year with administrative (i.e. unsupervised) probation. He has to pay a "victim/witness fee" of $50 (mandatory on any guilty finding) and a $50 administrative fee each month -- a total of $650. 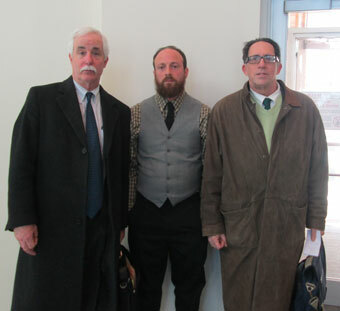 Left to right: Peter's attorney Stephen Foley, Peter, and Brian Camenker of MassResistance in the courthouse. Stephen Foley is a smart, aggressive, and passionate pro-lifer who has represented Peter pro bono -- and has stuck with him through thick and thin. Unfortunately, he can't take on the appeal. From now on -- unless this gets appealed -- all of the enemies of the pro-life cause, including the various police departments, can now label Peter a convicted criminal and treat him accordingly. This is outrageous. He was simply exercising his Constitutional rights for the pro-life cause, trying to reach the young people who most need to hear the message. Unfortunately, it's estimated that an appeal costs a minimum of $5,000 just to prepare, and there is a very short time frame to do it. Peter is currently trying to find an attorney to file it for him. We'll keep you posted. A lot of people talk about being pro-life. Peter D'Attilio actually does it. He gave up a successful landscaping business to go into inner-city neighborhoods and educate young people on the truth about abortion. He has endured enormous abuse, been arrested several times, jailed, even been beaten up by police. How many people are willing to face that? But he has had wonderful successes bringing the light of truth to hundreds of young people whose only other sources of information are Planned Parenthood and pop culture! Right now he needs everyone's support. You can contact his ministry Defenders of Women at: [email protected].